Today systems based on DDR chipsets are in a very interesting situation. The number of sold DDR solutions (PCs and boards separately) on all chipsets doesn't exceed the number of solutions based on a single i850 chipset and the Pentium4 processor. DDR memory manufacturers (Micron, Hyundai, Samsung, NANYA) that hoped to earn good money haven't yet seen any good income in this business. Even at the lowest price difference the majority of users prefer SDRAM. But at last the technological process is debugged, and companies can slash prices even for the most efficient PC2100 CAS2 DDR modules. The first was Micron, but it is obvious that other companies will follow it very soon. In a such situation DDR solutions will quickly become very attractive - a real difference in the price for ready systems will be defined only by the boards, which are expensive than SDR competitors by some 25%. But an extra 5% charge for a system block is a good deal for 10-15% performance gain. So, we are on the eve of a new turn of a price war between two perspective platforms: AMD Athlon + DDR and Intel Pentium4 + RDRAM. The first pair is backed by Micron, that reduces prices for DDR. But it should be noted that it is difficult to purchase a non-brand DDR module, while there are a lot of cheap faked-up PC133 SDRAM modules. Besides, the DDR is supported to some extent by Pentium III systems but the performance benefit is not so considerable as in case of the Athlon. The second pair has also amazed us by an enormous price reduction for Intel processors, and many are ready to buy it right away just because Intel products have never cost so cheap. It is difficult to tell a winner right now, especially considering that new processors appearing these days can drastically change the course of the history. Here are some of them - Athlon4 Palomino, Pentium III Tualatin, Pentium4 Northwood, Xeon Foster. The today's hero - the SiS735 chipset with AMD Athlon and DDR memory support hasn't forgotten to take its piece of the pie. At the price of $27 and with its possibilities the chipset together with its brother SiS635 is a budding player on the DDR chipset market. 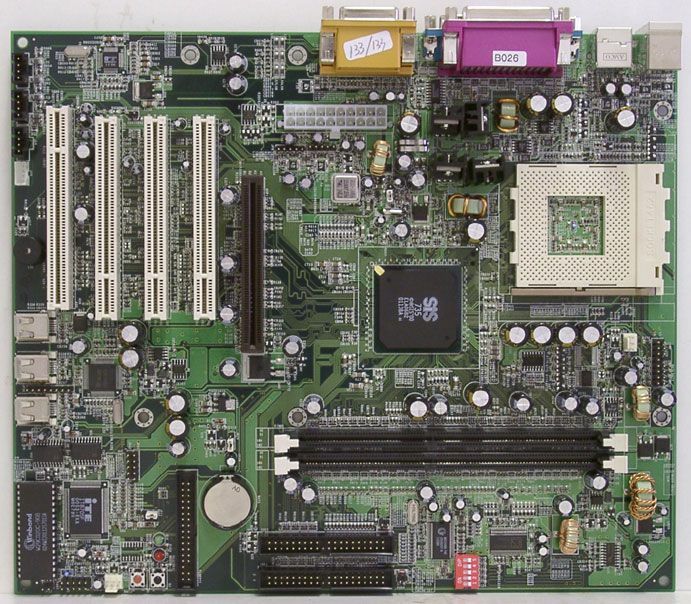 A mainboard on the most efficient DDR chipset, AMD760, is difficult to find. 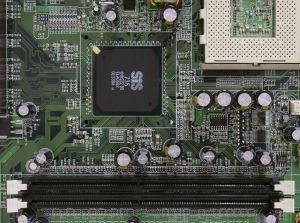 Many manufacturers consider a shortage and a price of the processor together with a 6-layer design of the board a serious obstacle for sale and promotion of their solutions on the AMD760. But by reducing the price and starting a large-scale production of it the company can just kill the market and ruin their relations with all other manufacturers which are making every effort to increase sales volumes of processors. So, the AMD760 board is a rare expensive exclusive product, but thus they don't damage interests of VIA, ALi, and SiS. The ALi MAGiK 1 is by contrast easy to get, that is why it attracted attention of all brand-name board manufacturers. But today one actually can purchase ASUS A7A266 and Iwill KA266. However, the chipset is not under sale simply because manufacturers can't find a right sphere of its application and don't know what boards should be based on it. The performance shown together with the DDR-memory is only a bit better than that reached together with the PC133 SDRAM, in some applications the latter couple goes even ahead. So, if new revisions of the chipset, drivers and the BIOS won't improve the situation, the ALi MAGiK 1 will play on a lower level coupled with the SDRAM, where it will be able to compete against the VIA KT133A. By the way, not so long ago Acer Labs Inc. announced one more chipset - M1649 which is, in fact, the ALi MAGiK 1 lacking DDR SDRAM support. It costs cheaper and is positioned as a direct competitor to the VIA KT133A. So, now we have only two - the VIA KT266, mainboards on which are already appearing on the shelves, though the debugging process hasn't stopped yet, and the SiS735. Today the budget solutions on the 630 and 730 from SiS are very popular, though there is a shortage of production facilities. Nearly all produced chipsets are consumed by only two companies - ASUS and Elitegroup, and in case of success of the SiS635 and 735, exactly these companies will be main partners in their promotion. So, what's the strength of the SiS735 ? The SiS chipset differs from other chipsets, as you know, in an untraditional approach: a north and a south bridges are combined in one chip. And all advanced technological processes play in hands of the company - now they can make chipsets more complex and perfect without caring about high percentage of defective products. Besides, SiS, unlike VIA, has its own high-tech production facilities, and chips, therefore, cost cheaper for the company than those produced by Taiwanese monsters - TSMC and UMC. But, unfortunately, there is a shortage in their own facilities, and the company will probably soon apply to the third party. But the production they have today and "two-in-one" chipsets give a good advantage in the price wars on the chipset market. Due to the SiS630 and 730 chipset ASUS, which traditionally earns more than its competitors, manages to press MSI and Gigabyte on the market of third countries offering mainboards priced lower than $60. It is obvious that such dumping policy is also applicable to the new chipsets. And their price of $27 will help the SiS735 boards to surmount a psychological barrier of $100 (this may happen even in the case of boards with support of both memory types). It seems that the SiS735 will sell good without attracting too much attention to its performance, thus catalyzing price reduction for DDR-chipsets from other manufacturers. Now we are turning right to the SiS735 chip. We will abandon a traditional approach of paying the major attention to the north bridge, leaving a couple of lines for a south one and an interaction way for the bridges. It is connected with the fact that SiS doesn't show up technological aspects of pipelining and buffering of data flows in the north bridge. By the way, a rather scarce information support has always been a weak point of SiS. Let's start with a system controller, also known as a north bridge (NB) which supports all modern functions. The processor bus controller EV-6 supports Athlon/Durons for the Socket-462 with the bus frequencies 200 and 266 MHz. The memory controller supports PC66, PC100 and PC133 SDRAM, as well as PC1600 and PC2100 DDR SDRAM. The memory supported is the same for both types and makes 6 banks (3 slots) with a possibility to install modules up to 512 MBytes (1.5 GBytes totally). The memory interface can work both synchronously with FSB, and at the frequency +- 33 MHz irrespective of the memory type used. It means that the Athlon with the 200 MHz bus can be used both with PC100 SDR and PC1600 DDR, and PC133 SDR and PC2100 DDR. And on the contrary, in a system on the Athlon with 266 MHz bus the chipset will allow for PC100 SDR and PC1600 DDR modules. The AGP controller is compatible with the AGP v2.0 specification and supports everything necessary for the maximum compatibility and efficiency modes - AGP 1X, 2X and 4X, as well as SideBand Addressing (SBA) and FastWrites. For increasing the performance of the AGP subsystem the developers use pipelining, and a 8-channel cache for GART for 16 records. The south bridge has a great deal of functions. It has two IDE channels with UltraDMA 33/66/100 protocols support, 2 USB controllers with 3 ports support each and a possibility to install up to 6 PCI BusMaster devices. Besides, there is a normal network controller supporting 10/100 MBytes Fast Ethernet or 1/10 MBytes HomePNA 1.0/2.0, with drivers for all operating systems. The chipset provides a possibility to use all additional expansion slots including AMR, CNR and ACR. And of course, you can find there an integrated AC'97 sound. I also should note a support of the integrated RTC, PS/2 controllers for a keyboard and a mouse, and interface for an external LPC (Low Pin Count) controller. And now I will draw your attention to a controller connecting the bridges of the chipset. A low prime cost of the chipset is not the only one advantage of packing the NB and the SB into one chip. The major advantage is a possibility to extend a throughput of the bus between the bridges. One may oppose saying that the Hub Architecture and the V-Link which provides 266 MBytes/s is more than enough. But on the other hand, there is a USB 2.0 or even more greedy SerialATA... Intel and AMD, for example, has been promoting their technologies Infiniband and Hypertransport. And the SiS735 is again fully armed - the engineers have tied the bridges by their own unique technology - MuTIOL (Multi-Threaded I/O Link) which provides a bandwidth equal to 1.2 GBytes/s. It's impressing, look at this bus closer. The idea is the following: the epoch of the "Bus Master" is coming to its end being unable to provide the required pipelining and parallelism. So, now engineers are developing new protocols based on high-efficient commutators providing a possibility of Concurrent Access for all devices. But these technologies are too complex for connection of a SB and NB, but the idea of parallelism suits perfectly. This idea was taken as a basic by the SiS developers. Thus they started to integrate the MuTIOL in their chipsets. Each built-in Master device, including 2 IDE channels, 2 USB channels, a MAC controller and AC'97 sound/modem, gets a dedicated stream that connects a device with a NB. Additionally a separate stream is provided for external PCI devices. So, a theoretical peak bandwidth makes the specified 1.2 GBytes/s. This approach will help to win in case of intensive operations with peripherals, especially in multitask applications. 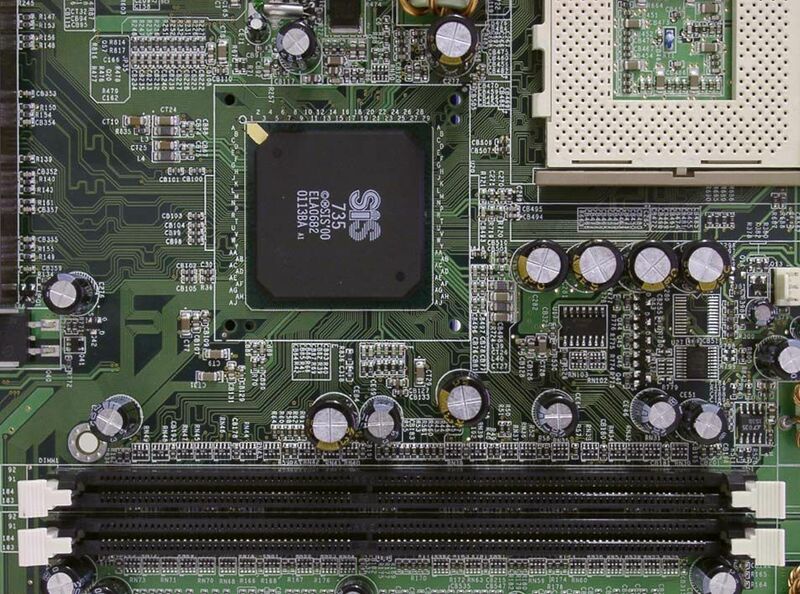 The SiS735 chipset is embedded into a 682-pin 37.5x37.5 mm BGA-case fabbed at 0.18 micron at the SiS' own factory. The Vcore is only 1.8 V, and the chipset doesn't heat up even after even a long period of exploitation. It saves mobo manufactures from supplying heat sinks and fans, and it provides a better stability for the system on the whole. On the other side, this approach has some drawbacks. With an increase in a digit capacity or in the number of memory buses (I should note that a dual-channel DDR is associated today only with the NVIDIA Crush, but not with SiS), or in case of realization of the Quad-Pumped Bus in the chipset for Pentium4 our chip should be equipped with a great deal of outputs. In this case board manufacturers will have to migrate to more expensive 6-layer PCBs. Since the material concerning this board is very interesting, the site's editors decided to compromise. In this article we won't give detailed information on the board itself and on the MuTIOL performance - you will get this information in the forthcoming update. I should note only that the stability and quality of the board implementation are very high and do not differ from production samples of top manufacturers. 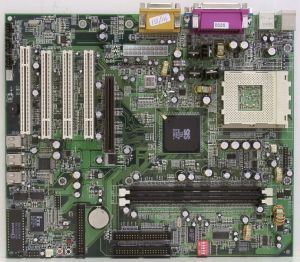 The board has a pre-production BIOS which can help you to change manually any of nearly 50 registers of the chipset intended for operating modes and latency of the memory, AGP etc. We tried to establish conditions for the fight as equal as possible for all competitors, that is why the results shown by the SiS735 chipset were achieved with the CAS2.5 and other settings close to those of competitors. All other chipsets were also tested with the DDR CAS2.5. On the other hand, the boards based on the chipsets with SDRAM support were tested at the minimal timings, because it is not difficult to find PC133 memory working with the minimal timings, and as for the DDR, today one can get only CAS2.5 modules impossible to overclock or without a possibility to decrease latencies. The chipsets with the SDRAM memory are working at the maximum performance level they are capable of, and the DDR ones have still some reserve. On the whole the SiS735 wins from all competitors in the 3DMark 2001 except the VIA KT266. Is that true that the AGP problems that not so long ago let the AMD760 down are also peculiar to the DDR-chipset from SiS? In the High Detail mode the SiS735 performs better than even the AMD760, and in the Low Detail mode, where the memory subsystem speed matters more than the AGP speed, the VIA Technologies chipsets beat all contestants: they are coming ahead by a great margin. The situation is again similar to the AMD-760 motherboard benchmarking. The VIA KT266 is leading (and even the KT133A) in the Low Detail modes. This superiority is also absent in the subtests Lobby and Nature! It is interesting that the SiS735 falls behind the AMD760 nowhere - it even beats the latter in the performance. Here the SiS735 doesn't shine. That's strange - considering that a memory subsystem in this chipset is quicker, than in case of the VIA and is on the level of the AMD-760, the results of the SiS and AMD in Quake III at low resolutions must be similar. But the SiS takes the middle leaving behind the ALi MAGiK 1 and VIA KT133A, but yielding to the VIA KT266 and AMD760. It again looks strange. What does this diagram mean? 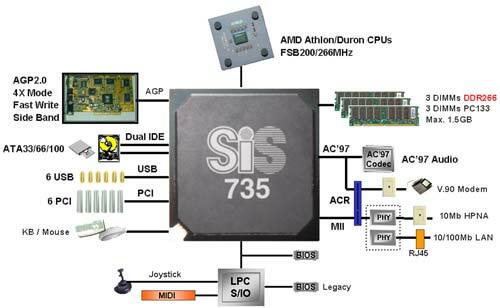 Here the situation becomes again explainable - the SiS735 shows the performance comparable to the AMD760. Losing sight of the Quake III diagrams for a while, we can see that the SYSmark 2000 and ZDM Winstone 2001 results are showing a close picture - in the first test the SiS735 and AMD760 are leading, falling one behind the other by turn in the Office Productivity and Internet Content Creation, and in the Winstone 2001 the SiS735 beats its competitor in both subtests. The new child of the Silicon Integrated Systems is a really good product. The SiS735 performs not worse than the ALi MAGiK 1, and in some applications it turns to be even faster than the VIA Apollo KT266 and the AMD760. Considering its price, the chipset has really a lot of things to be pride of. If no bugs are revealed, the company will get a trump allowing to compete against top leaders in the sphere of chipsets for Athlon-systems. However, in the field of serious workstations our hero won't be able to beat the AMD760 due to the lack of ECC-memory. But will the company manage to deliver the chipsets in the required volume so that the chipset can really compete in this field? But it is still unclear what caused such strange operation of the memory subsystem and the AGP port, well noticeable when comparing the results of the SiS735 and AMD760. In some tests the SiS leads, in other the AMD is ahead. We will make two suggestions, but they might be wrong. The first suggestion concerns the speed of the memory subsystem, which is sometimes better in case of the SiS, and in some tests the AMD excels. I think that the only reason for it is the AMD760's proprietary feature called SuperBypass. As you know, the SuperBypass allows to ignore in some cases some stages when processing requests for reading data from the memory or for recording there, what sometimes allows to decrease the latency maximum by 25%. But everything depends on an application. Further it is obvious: where the function works, the AMD760 is faster than the SiS735. And where the latency is less critical, the SiS takes the lead. The second suggestion is based on the fact that the SiS goes ahead by a great margin in the Quake III when the AGP data rate is one of the major factors, and in the 3DMark 2001, Rage Expendable and Unreal Tournament its performance is not so impressing. The SiS735's superiority is lost as soon as the chipset comes to the Direct3D API. This API loves DiME very much, i.e. it uses AGP-texturing. I hope that at least one "performance issue" of the SiS735 can be improved by debugging the GART-driver which controls the work of the AGP-video card with the memory (by means of the chipset) in the course of the above operation. However, the process can slow down.